Click on any question below to view our response. If you require further information after reading the answer, or you would like help in planning a strategy to deal with any issues in the questions, please do not hesitate to contact us by clicking here or opening the ‘Request more information’ panel (right). Traffic Orders are more commonly known as Traffic Regulation Orders (TRO’s) or, within Greater London, Traffic Management Orders (TMO’s). They are the legal records of regulations imposed by authorities upon the highway to manage traffic. Static Traffic Orders regulate the restrictions and prohibitions that apply when vehicles stop, wait, load/unload, or park. Movement Traffic Orders regulate the compulsory and prohibited movements of traffic including vehicle turns, direction of travel, weight, height, width, and speed. What is a map-based Traffic Order? Traffic Orders have traditionally had text schedules that list descriptions of where each restriction is located. This information usually states the street name, the side of the street and a description of its start and end points. 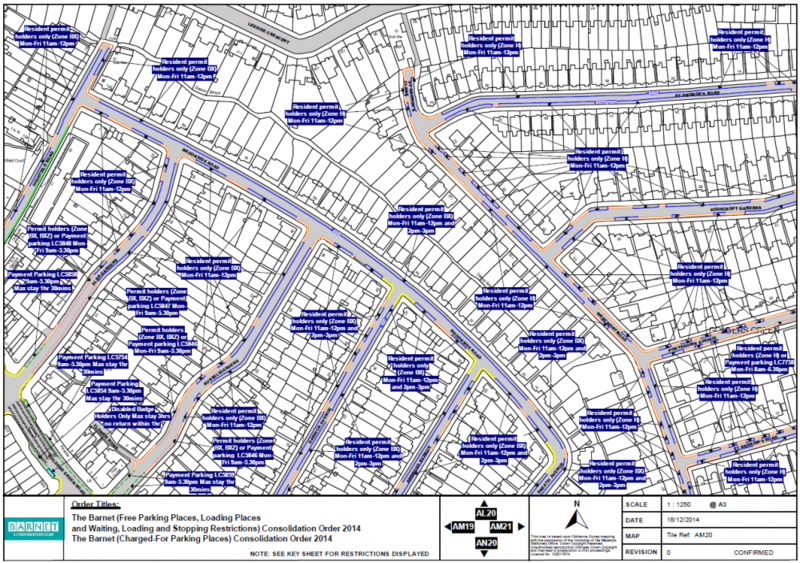 A map-based Traffic Order has a set of plans showing the mapping of an area and each restriction in these streets is represented in the plans, accurately reflecting where the restrictions are located. A map legend will indicate which representation correlates with each restriction type shown in the plans. Labels may also be included in the plan in order to provide information related to the specific provisions of each restriction, such as the days and hours of operation. How would I move from text Traffic Orders to map-based ones? The Traffic Order data needs to be shown against the underlying mapping of the area. This is normally achieved by GIS mapping the restriction data in a ParkMap system so that you also have system functionality to help you manage your map-based Traffic Orders. All restriction data to be included within the map schedules needs to be incorporated into a map tile grid of the area and the scale chosen for this grid should enable easy interpretation of the data – 1:1250 @A3 is a commonly used scale. Each restriction style used in the maps will also need to be explained in a map schedule legend (e.g No waiting). More provisions of each restriction can also be explained in a label within the map tile to expand on the map schedule legend description (e.g. No waiting, Monday to Saturday 9am to 6pm). The Articles to the text Traffic Orders will need to be re-written so that they explain the provisions of the Order for each restriction represented in a map schedule, rather than in a text schedule. 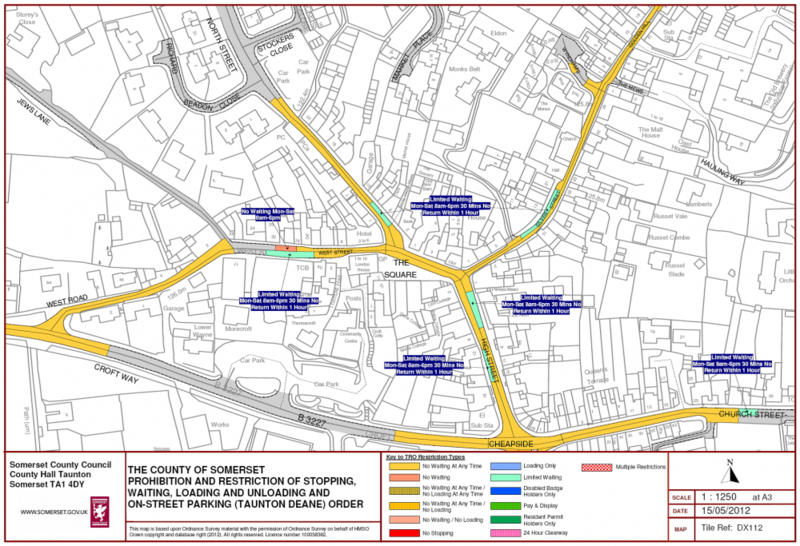 How do I plot Traffic Orders on new roads not yet shown on the OS mapping? 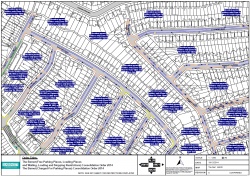 This is a common problem and occurs when new roads and estates require traffic management measures to be desinged and implemented before the OS have updated their mapping. Most highway changes and new estates are built to plans and there is normally an electronic version of these plans available. This is usually in the form of an AutoCAD® drawing or another GIS plan. ParkMap is able to incorporate these drawings as part of its mapping layer. 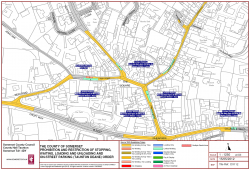 This enables you to design new restrictions for new areas of highway and produce consultation plans and map schedules for map-based Traffic Orders before the OS mapping is updated. 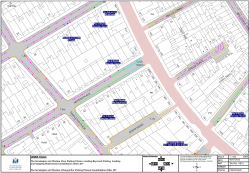 You may need to refine it once the new OS mapping of kerb lines are available, but this approach is preferable to the alternative of trying to show new restrictions against blank areas of mapping. If you would like any help with configuring ParkMap to incorporate alternative mapping, please do not hesitate to contact us. Should I have one map schedule for all restrictions? Traffic Orders are commonly grouped into static or movement prohibitions and restrictions. Most map-based Traffic Orders in the UK cover static restrictions only, but some authorities, such as Nottingham City Council, also use this approach for speed limit restrictions. It is probably not advisable to use a single map schedule for all restrictions, however. This is because the intention of map-based Traffic Orders is for information to be conveyed more easily than text Orders. Too much information on one map schedule may diminish its clarity. What is the difference between region mapping and line mapping of Traffic Orders? A region style: different restrictions are represented by a block of colour and/or pattern drawn between the kerb line and the centre line of the road. A line style and colour: for different restrictions are drawn along the road relative to the kerb line, reflecting more closely how they would be seen on the street. The originator of map schedules suggested that regions helped to convey the full extent to which a static Traffic Order restriction applies on the road: from the centre line of the road to the back of the highway boundary. Since the back of the highway boundary can be difficult to identify from mapping alone, the kerb line is used as a more reliable guide. This approach is also qualified with a written statement on the map schedule to indicate the full extent to which the region applies. At Buchanan Order Management we believe that line representation more accurately reflects the way in which restrictions are marked on the street making it easier for users of map schedules to interpret the data. Should I include non-Traffic Order data in the map schedules? Map-based schedules set out the restrictions and parking places provided by way of Traffic Orders. However, there are also restrictions that authorities with civil enforcement powers can enforce which do not require a Traffic Order to be implemented on-street. Bus stop clearways and pedestrian crossings are common examples of this. Whilst some might argue that these should not appear on a Traffic Order map schedule, we would suggest that they are included. This is because it would help to provide a more complete understanding of the enforceable restrictions on the highway. We would recommend that such items are clearly identified within the map schedule legend as non-Traffic Order information, to ensure clarity. We recommend this approach because it helps to avoid ambiguity and misunderstanding. Map schedules that do not include such items must either show a gap at the point where they exist or an alternative restriction (such as those existing on either side of the non-Traffic Order item). In these instances, what is represented on the map is not an accurate reflection of the on-street reality. Furthermore, if a contravention is recorded regarding a bus stop clearway or pedestrian crossing, it is logical for the representation of that restriction to be represented on the map. Difficulties may arise when a non-Traffic Order item included within a map schedule is either removed or moved to a new location. This change may result in the appearance of a gap within the data. We would suggest that a Traffic Order restriction be implemented to cover this gap. This would involve making an amendment to the Traffic Order in accordance with the statuatory requirements for making a new Traffic Order. What is a Traffic Order map tile or plan? A Traffic Order map schedule comprises of a set of map tiles or plans. These connect together to form a grid of the entire area covered by the map schedule. Each map tile or plan will have a unique identifier code that will enable that tile or plan to be distinguished from any of the other tiles or plans making up the map schedule. Should I use one or more map-based Traffic Orders for my authority’s area? There are different ways of looking at the information contained within a Traffic Order. There are differences arising from where the Order is made. In response to the first point, a Traffic Order may reflect either static or movement Order provisions. These may occasionally be combined in a single Traffic Order, but this is rare in practice. Often a Traffic Order will include only one category, such as ‘waiting and loading’ or ‘parking places’ for static Orders, or ‘speed limits’ for movement Orders. 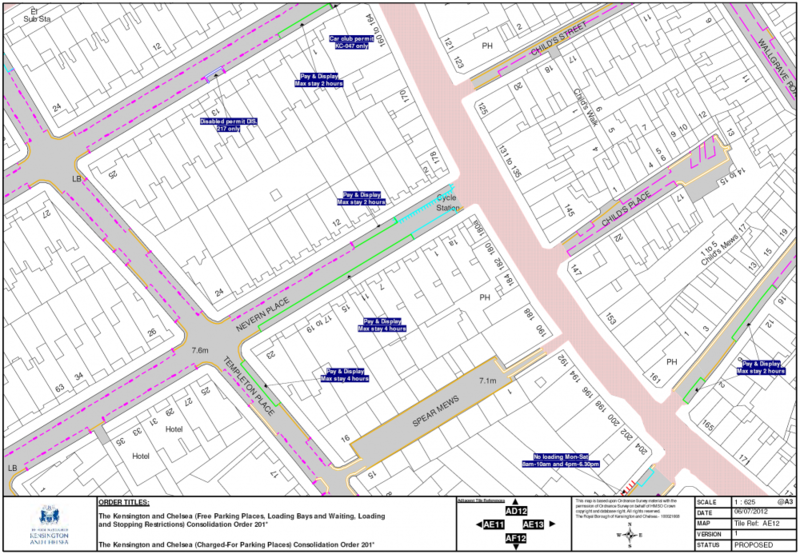 Showing all static restrictions on a map schedule helps to convey a comprehensive understanding of what prohibitions and restrictions apply on each street. This would not be communicated as effectively should different restrictions be included on different map schedules. However, this may not always be the case. For example, movement restrictions, such as speed limits, are easier to view and interpret if contained on separate map schedules from other movement Order categories. It is for each authority to determine how best to convey the provisions of their Orders. In relation to the second point, there is a difference arising between authorities within London and those outside of the capital with regards to the legislation. This legislation states that different Traffic Order provisions can be combined outside of London. This implies that it cannot be done within London. Thus, in practice, London authorities combine all Traffic Orders with provisions related to charged parking and all those related to free parking or non-charged prohibitions and restrictions, but they do not make a single combined Traffic Order for all static Orders. They do, however, tend to use a single map schedule for these Orders, so that all restrictions along the street can be easily interpreted by users of the Orders. If you have further questions, or you would like to propose other core issues in Traffic Order management that we could address as additional FAQs, please do contact us. Disclaimer: Please note that we are not legally qualified to offer advice, interpretation, opinion or recommendations with regards to any existing legislation. Therefore Buchanan Order Management and its staff can accept no responsibility for any action taken based on the advice, interpretation, opinion or recommendations on existing legislation that is stated or implied through this website. We strongly advise that you seek advice from your own legal representatives before placing any reliance upon the information provided by this website.